I grew eager each December when the Christmas cards feathered out from a neatly stacked pile into a pitcher’s mound on the dining room buffet. It meant the one mimeographed Christmas letter would soon arrive. As I reached junior high, I couldn’t wait for what was the genre’s quintessential stereotype. The letter — who had a mimeograph machine? — addressed to my parents brought clinical news of wonderful summer trips and grand deeds. It detailed another year of the perfect marriage, an obligatory health scare, accomplished children and adorable grandchildren. It was the inspiration for the first Christmas letter I would send. Single and childless in my early 20s, I wrote how my “2-year-old is quite a horse. In fact, he finished second in the Preakness this year.” I explained in my card that the springboard for the letter had been this annual report from a wealthy and proud grandmother who went to our church. As with most of my antics, Mom was somewhat amused but questioned the wisdom of naming the woman. As if those who received my cards would have known her. But Mom was a diplomat. One summer day when I was about 12, the barber who worked for Dad suffered a stroke in the middle of a haircut. Mom somehow delivered the news to a soon-to-be widow, offering neither promise of hope nor cause for hysterics. I was fairly certain I had seen my first dying man moments earlier. Years later, it occurred to me that telephone conversation was my first Zen moment. Mom was a dedicated author of Christmas card prose tailored to each person on her list. She likely hoped I would emerge from this phase of mocking the Christmas letter. But it went on for over a decade. One year I had gone trick or treating with Vice-President Dan Quayle, whose intelligence was suspect. He was dressed as a speed bump. Another edition contained a 12-paragraph story written in noir, Raymond Chandler style, about people at work getting their lunches stolen. n which kids had been asked to write a fictional Christmas essay. I expressed my irritation that the one I included should have won: “Christmas Aboard the Space Shuttle” by C. Shore. I’m pretty proud of that one. Mom was no idiot, but she liked what the little girl wrote. I told her there was no contest, and I had written the essay. In her defense, I read it this week. I did a more than adequate job of channeling a 12-year-old girl for that piece. Which is a little disturbing. My cards included photos taken by professional photographer friends for no pay. Me, sitting in a pasture surrounded by cows with a typewriter connected by jumper cables to a car battery. Me, rolling a putt midwinter onto a green, the golf ball having accumulated snow to the point it was larger than the bottom of a snowman. It could not have been less Mom-like. In flowing, artful penmanship she wrote something in each of the dozens of Christmas cards and signed most of them “Love, Ruth.” It was a weeklong project that was not optional. She had worked in Washington, D.C., after World War II. I’d see cards from these faceless people annually, read what they wrote and try to imagine their connection to Mom. Now and then, Mom would finish reading a card from someone in D.C. and say, “It’s too bad the only time we hear from each other is at Christmas.” I’d tell her there was nothing preventing more contact. Then I got old and realized that not staying in touch is just how it is. As time swirled along it was common for a year or two to pass without hearing from some of these old friends from D.C. She would quit sending a card to that address, figuring the worse. Sometimes a survivor would send a Christmas card with the bad news. From a life before me, friends of Mom whom I never knew and who faded with the years. Carving time for personal notes in Christmas cards seems like a World War II remnant because I connect the exercise with these mysterious people from Mom’s post-World War II years. I suppose most children of The Greatest Generation lived in the fumes of World War II at Christmas. “White Christmas” and “Baby It’s Cold Outside” were spilled out during World War II. “I’ll Be Home for Christmas” and “Have Yourself A Merry Little Christmas” have lush orchestral notes that duel with soul-withering words when imagined from the early 1940s. As I got into high school and the glitter of loot at Christmas dimmed, Mom’s card ritual made anticipation of Christmas exceed the actual event. She was diligent about writing letters with the cards until the year that it fell upon my sister to send that card with news that there would be no more cards from Ruth. It was their loss. 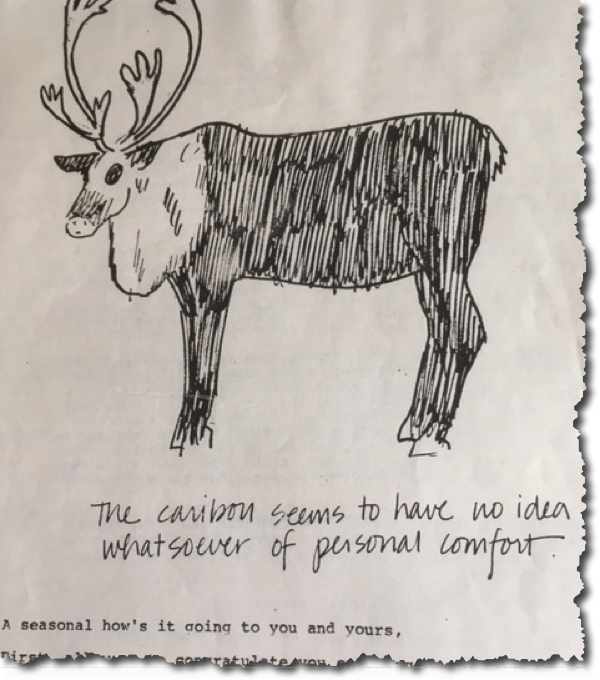 My annual, mocking Christmas letter ended when it became a chore and as tedious to read as the mimeographed letter that once arrived at our house. It was nobody’s loss.